Aren’t words powerful? Come on, admit it. You know they are. Powerful enough to rouse the sleeping beast within, calm the troubled heart, or stimulate the deepest of thoughts, words are amazing creations. Fortunately for me, I have friends who feel the same about the fun, power, derivation, and meaning of words. A few weeks ago, a group of logophiles met to share new words over lunch. That morning, I had listened to a podcast by Gretchen Rubin, author of The Happiness Project, and was reminded of the difference between satisficers and maximizers. After sharing our new words, I hesitated before adding these two words to the mix. Were they too frivolous? Was I partial to them only because of my interest in positive psychology and happiness? After about three seconds of hemming and hawing, I shared Rubin’s words, and we all decided we were (are?) satisficers in most areas. That word, by the way, is a combination of satisfy and suffice. Since then, I’ve been pondering just how important one’s attitude towards “good enough” vs. perfection can affect happiness and overall well-being. I think Rubin is on to something. Further investigation by a lunch partner revealed that this idea was espoused by Barry Swartz in The Paradox of Choice. Here’s an edited version of what I posted on psychcentral.wordpress. com earlier this morning. Writer Gretchen Rubin, author of The Happiness Project, and creator of the book related blog and podcast, has tackled the concept of happiness with zeal. Although she isn’t a psychologist, Rubin incorporates the theories of philosophers and psychologists into her personal observations and experiences. A gifted writer, she makes learning about happiness interesting. One of Rubin’s ideas is based on that of psychologist Barry Swartz, author of The Paradox of Choice. Swartz contends that choice overload can actually make us less happy as we set our expectations too high. Should I try the vanilla latte or the sea salt caramel hot chocolate?? And what about paint color? Would Soothing Aloe look better on the dining room walls than Morning Zen? And then there are relationship issues. We’re told to “never settle,” and yet is there really a Mr. or Ms. Right waiting in the wings? Instead of agonizing on and on about decisions, Swartz and Rubin advise readers to go with “good enough.” People who do so are called satisficers and are generally happier than the maximizers those who make perfection a quest. Years ago, I was involved in a fender bender and had to go car shopping. Friends inundated me with information about price, makes, models, reviews, mileage estimates, and deals. I listened for a while but then began to get a little dizzy with so many facts and opinions. After work one afternoon I drove the rental car into Sparks Toyota with some ideas about what I wanted. Small, good on gas, and affordable were the top criteria. I knew I couldn’t buy (wouldn’t buy) a new car, but I didn’t want to buy a clunker either. As soon as I walked on the lot, I saw it: a dark green Corolla that was two years old. The salesman was a little surprised at the quick decision, but he didn’t try to talk me out of it or sway me to a more expensive option. A friend, incredulous that I had made such a snap decision, told me that most people didn’t buy cars that way. Instead, they did a little research first, even traveling across the state to see and test drive different models. She admitted that it usually took several months for them to make a decision and that even then, she and her husband ended up second guessing themselves. They’re maximizers, and I’m a satisficer. What about you? Do you have to have things “just right” to be happy, or is good enough okay? Author jayne bowersPosted on March 24, 2015 March 24, 2015 Categories books, choices, decision making, happiness, life, psychology, wordsTags choice, Gretchen Rubin, happiness, word power, wordsLeave a comment on Good Enough or Perfect? Author jayne bowersPosted on March 11, 2015 Categories Behavior, choices, faith, gratitude, happiness, health, lessons, life, psychology, UncategorizedTags being happy, psychology, religion1 Comment on Let’s Get Happy! I’m going to cut myself some slack this morning. A couple of days ago I wrote about David Steindl-Rast’s interview on NPR in which he advised people to STOP, LOOK, and GO when it comes to their day-to-day experiences. I enjoyed the interview so much that I immediately purchased his book 99 Blessings for my Kindle. STOP long enough to catch your breath and observe your surroundings. LOOK at where you are in your life and at the sights surrounding you this very moment. If this moment is sad, painful, disappointing, or frustrating, there’s no need to despair because just like the present moment is a gift, so are jillions of others that you will have. GO forward secure in the knowledge that more opportunities and precious moments are ahead. I think the reason Steindl-Rast’s ideas reverberated with me so much is that sometimes I, like so many others, go through life at full blast. We rush about “getting and spending” and scarcely notice the new buds on a tree or hear the sweet birdsong right outside of our window. We get perturbed at traffic jams, slow drivers, and spilled milk when in actuality, these things don’t matter. What matters is our reaction to them. But that’s a topic for another day. I wish I’d written about more of those moments. I wish I hadn’t waited until I was in my mid-40’s to begin keeping a gratitude journal. It’s sad to think of all of those many moments when my children were younger that have now just slipped right over into oblivion. But as Steindl-Rast said, there will be other moments of opportunity. Today is my day to STOP, LOOK, and GO. It’s yours too. And it’s so easy, Folks. I have my iPhone with me just about all the time, and I’ve begun using it to its maximum potential as far as stopping and looking. Whether it’s a nature scene, a child’s face, a seashell, a deserted building, or a pier, I’m going to snap the picture. Then I’m going to go forward knowing that I’ve been mindful enough to capture a little slice of life. Since January, I’ve begun posting a “pic of the day” on Facebook, and at the end of the year, I’m going to compile them into a Shutterfly book. I wish I’d done it earlier in my life, but alas, I didn’t. At least I’m on the right path now. What is something that you do to stop, look, and go? Please share. When I learned about this double duty day, first day of spring and day of happiness, I actually felt, well, you know, happy. I had recently read Gretchen Rubin’s The Happiness Project and was already familiar with the work of psychologists Martin Seligman and Dan Gilbert. I know that money, fame, and education don’t create happiness, and that gratitude and forgiveness can contribute to it. Even so, I’m always eager to learn more about this essential emotion. My lesson came from the radio. I listened to an NPR interview with David Steindl-Rast, a Benedictine monk, whose most recent book is entitled 99 Blessings. Steindl-Rast contends that happiness is born of gratitude and not vice versa, and he offers a method that we all can use to help us live more gratefully. We all know people who seemingly have everything that money can buy and yet they are unhappy. We also know people who have misfortune, illness, and tragedy in their lives, but somehow they are happy. According to Steindl-Rast, that’s because they are grateful and are aware that every moment is a gift. Grateful people are aware that every moment is a gift, and Steindl-Rast states that everyone has the ability to develop this same awareness. We often say that opportunity only knocks once, but according to him, that’s not true since each moment is a new opportunity. If you miss the opportunity of one moment, there’s no reason to fret. Another moment is promised to us…and another and another. Steindl-Rast says there is a very simple method that will help us live gratefully. We must Stop, Look, and Go. He admits that stopping is hard for many people. Busy, we rush through life and therefore miss many opportunities because we don’t stop. 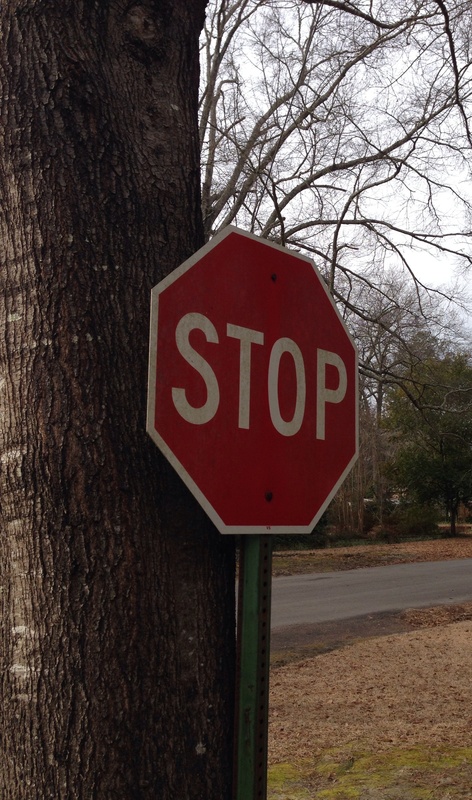 We have to build more stop signs in our lives. STOP! Whatever life offers you in that moment, go with it and realize that it’s a gift. We need to STOP, take a look around, and be grateful for the moment. Plus, it’s comforting to think that no matter how many opportunities we have missed, there will always be another one. Maybe you were meant to miss that first one. That job, that relationship, that phone call, and that interview were not the only moments and gifts you will have. Something better is on the horizon. While listening to this interview, I had the thought I’ve had many times, that there’s really nothing new under the sun. Anyone who’s familiar with positive psychology (or even pop psychology) knows that an attitude of gratitude is essential to happiness. And yet, there was something that touched me about this monk’s words. As an experiment, STOP right now, LOOK around you, and think of how grateful you are for this moment. If you’re not happy with this moment, realize that it’s just one moment, one point in time, and that there will be millions of others. GO forth with the knowledge that you will have many future moments filled with opportunity. Great photo, huh? 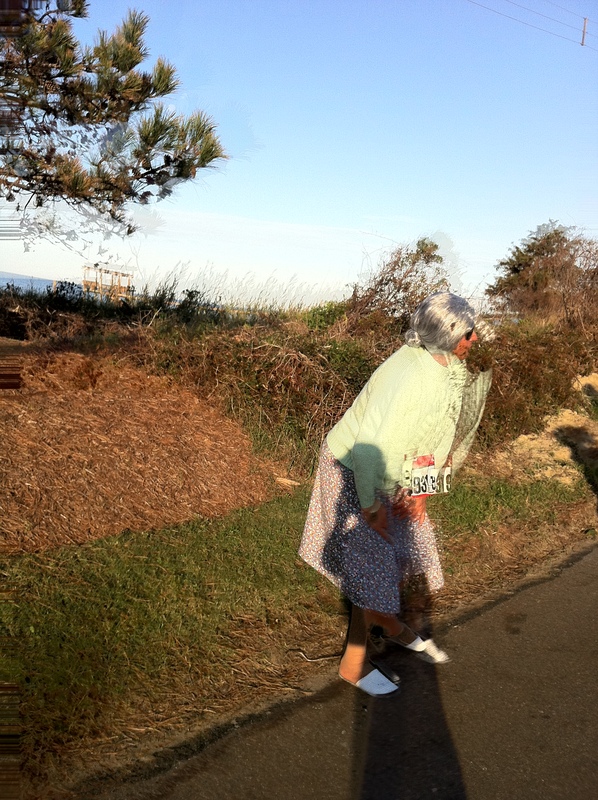 I snapped it along the route of the OBX half-marathon in 2012 because of the unique appearance of the person cheering us on. I loved her (his) joie de vivre and think it fits perfectly with this post. Although I didn’t think much about being an individual true to her own values, strengths, and interests in my earlier years, it has become increasingly important, not only in how I live my own life but also in how I encourage others to live theirs. We’re all children of the universe, in a manner of speaking, and just like snowflakes, we’re all unique. Wouldn’t it be a dull, boring world if we looked, thought, and acted alike? Accepting and BEING who and what and how we are has applications for many areas of life. Take occupation, for example. There are people who love being accountants, and they’re darned good at it. I, on the other hand, can’t even keep my checking account in order! The fact that it’s online now and can be checked 24/7 has made it easier. My husband faithfully records his debits and credits in an Excel document and has even set one up for me. When I recently almost ran into a problem with my account, he reminded me of the value of recording the data in Excel. “If you’d just do it my way, you’d know exactly what was due and when,” he chided. “That’s you, Hon. It’s not me,” I replied. “I know, I know. And hey, I’m going walking in a few minutes. Want to go?” I asked. “But walking isn’t something I enjoy,” he said. Speaking of attire, last week I had the opportunity to meet with an old friend for lunch and a walk along a river’s edge. It was awesome. But here’s what I wanted to share. She was wearing a beautiful vintage necklace, and when I complimented her on it, she said she had given it to her daughter for Christmas but that her daughter had returned it with the comment, “It’s you, not me.” I knew exactly what my friend was talking about. Even in jewelry, we have our preferences, our looks. What about you? Do you ever struggle with being you? Do you sometimes feel that you need to be or do or act the way others think you should be? Please share.